There at the end I put some day lilies that my parents gave me, they seem to be bouncing back from waiting nearly two weeks for me to plant them. I planted a mixed pack of sun flowers on the left and nasturtiums on the right all the way up the bed. Right in front of the day lilies I planted some sage in the middle and thyme on the edges. Then I just dumped in several mixed packets of flower seeds to fill in the rest. Mostly annuals, but some perennials as well. 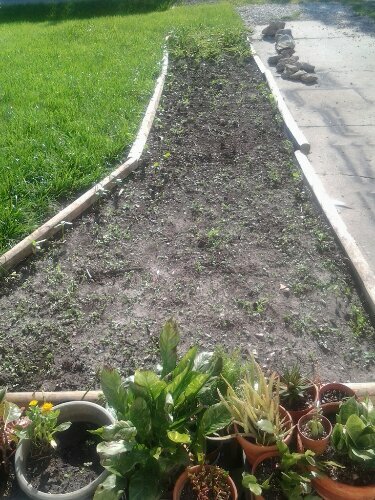 I do see some weeds coming up mixed in with everyone but I see a lot of stuff I recognize as flowers that I planted. 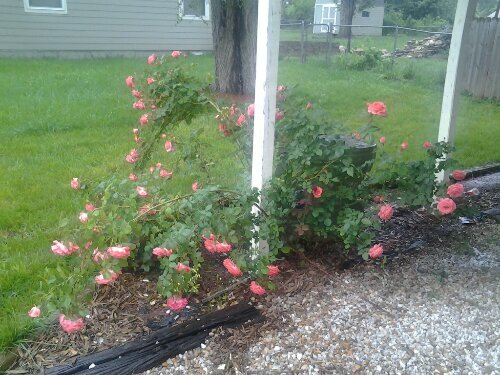 I am looking forward to seeing it in another month or so when it starts to bloom. I didn’t do anything special to it so I have no idea what is going on but it looks nice and smells wonderful too. I did tie it up so it’s not laying on the ground a couple days after I took this picture. I’m hoping that it doesn’t break if we get some good winds here. I tried to be careful about the way I tied it to keep that from happening, but only time will tell. I’m having some issues with germination of my seeds in the garden again this year. It’s gotten frustrating for me to have such poor luck for two years in a row. It’s making me wonder if I have some issue in my garden I don’t know about. I am guessing my problem this year is a combination of the colder then normal spring and all the rain we have gotten making the seeds not germinate before they rot. It’s just frustrating. I know some of the seeds I’ve planted are older seeds, but some are new this year too so it’s not just that. I’m replanting some stuff yet again here this week, the weather is supposed to warm up and stay warm for a bit. Hopefully that will solve my germination problem. I’m just not sure what to do if it doesn’t. I’m not planning on giving up on gardening, but I sure do wish it was less frustrating some times! The other issue I am concerned over is a lack of pollinators I’ve seen in the garden. I’ve planted tons of flowers as usual to lure them in and I’ve still seen none so far in my garden. I did see a couple big bees at my parents house last week finally, but none here. I’m hoping the weather is affecting them too and I will start seeing them as it starts to warm up.